Industry updates, challenges or big issues coming up in the next 3-6 months in the SDN NFV environment. As service providers progress towards network virtualization, the hot topic of NFV license management becomes critical to solve. In our increasingly software world, volumes of VNF instances - from many vendors - can be instantiated anywhere on demand. ETSI and TM Forum understood this need and have been instrumental in accelerating standardization in this area. In this webinar, experts Don Clarke (Principal Architect for Network Technologies at CableLabs and Chair of the ETSI NFV Network Operator Council) and Abinash Vishwakarma (Senior Member of Netcracker’s CTO group and Leader of the ETSI NFV License Management activity) will explain the motivation for service providers to quickly develop standardized methods for NFV License Management and describe the fast progress the standards groups are making. Enabling a simple, visually oriented platform that customers can use to design and order complex network services is very important strategy to drive digital transformation and meeting demands for superior customer experience. Verizon Service Designer, Intuitive Visual Design tool, is a cornerstone Strategy for Enterprise customers. - It as a unified portal to create, maintain, manage large complex E2E network designs for legacy, Wireless, IOT, SDN/NFV Network services. - Manages lifecycle from service design to configuration by tying together BSS and OSS stack by abstracting away complexities. - Improves Network Agility through on demand creation and consumption of network services. Zero-touch is the latest initiative to emerge from the Carrier Virtualization movement. Zero-touch suggests “hands-free” operations, what Cloud-folks refer to as “NoOps”. While NFV & SDN based services are intended to liberate CSPs from the bounds of physical infrastructure, however the highly-dynamic environments they will create will move too fast for human decision-making and intervention. To ensure that Zero-touch is more than a buzz word will require sophisticated autonomous systems and seamless interoperability to handle service requests and respond to network events in real-time. This webinar will feature a presentation by Dave Duggal, founder and CEO of EnterpriseWeb, which won a Layer 123 “Network Transformation Award” for Interoperability at the SDN & NFV World Congress in October. EnterpriseWeb is an innovative startup that offers a framework for extreme automation. Their suite of Cloud-native products provide for secure, scalable, zero-touch operations with policy-based management. The webinar feature a product demonstration showing how customers using EnterpriseWeb can onboard any heterogeneous VNF or PNF, compose them into any arbitrary Network Service, and deploy them with any diverse target environment (multi-VNFM, multi-Cloud, multi-VIM) – with no manual coding! The demo will go on to show how their software dynamically responds to events and how services can be reconfigured using simply Metadata. Discover how Telstra has leveraged the development and deployment of an open source software based national SDN & NFV network to spearhead the transformation of its engineering and operation teams and their methodologies. ETSI Open Source MANO (OSM) is a collaborative open community focused on delivering an open source Management and Orchestration (MANO) stack aligned with ETSI NFV Information Models. As an operator-led community, OSM is offering a production-quality open source MANO stack that meets the requirements today and in the future for competitive, commercial NFV networks. Since its inception in February 2016, OSM has grown to encompass almost 80 organizations and three releases. The NetNumber Multi-protocol Signaling Firewall is the industry's most comprehensive signalling firewall, providing protection for all signalling protocols including SS7, Diameter, SIP, HTTP and DNS/ENUM. As these firewall applications can be combined seamlessly with other NetNumber applications such as an STP, DSC, HSS or HLR on the same TITAN platform, telecom operators have an unprecedented level of multi-protocol signaling protection, flexibility and operational uniformity in a platform that can reduce Opex/Capex costs and improve efficiency. NFV/SDN creates a need for a new way of enabling the operations of the lifecycle of services in a hybrid network. We already know that manual operations in a physical world won't scale. However automation, through simple scripting of manual operations, also won't be able to scale to meet the needs and all the variations that could occur in a hybrid network of virtual and physical components. The ability to automate through machine enabled automation is required, combined with operations that utilize cognitive computing to outthink the network. Join us as we overview cognitive networking in a world of NFV/SDN. This webinar introduces the ETSI Family of Common NFV APIs that enables a modular and extensible framework for automated management and orchestration of VNFs and network service (NS) within an Interoperable Ecosystem. This webinar will cover VNF lifecycle management operations and related use cases – onboarding, operation, instantiation, scaling, etc. and detail the new ETSI API specifications that permit NFV Orchestration and Interoperability. The concept of NFV has been around for several years already and its benefits need no further explanation. However, it is fast becoming clear that actually getting Virtual Network Functions (VNF) to run seamlessly on the select software & hardware infrastructure proves to be a challenging task. It requires a significant amount of engineering work to get even a single VNF to run on a new platform and tweaks and tricks are often required, both on the VNF and on the NFVI side. In this webinar we will address these challenges and present a systematic verification and validation methodology based on devops concepts, employing a high level of automation that ensures successful VNF deployments – all the time, every time. This webinar will present the brand new Open Source MANO (OSM) community, recently launched under the umbrella of ETSI, and holding its first official meeting on 5th April. OSM is focused on delivering an open source Management and Orchestration (MANO) stack for NFV capable of meeting the requirements of production NFV networks while consuming an established common Information Model (IM) – all defined, implemented and released in open source software. 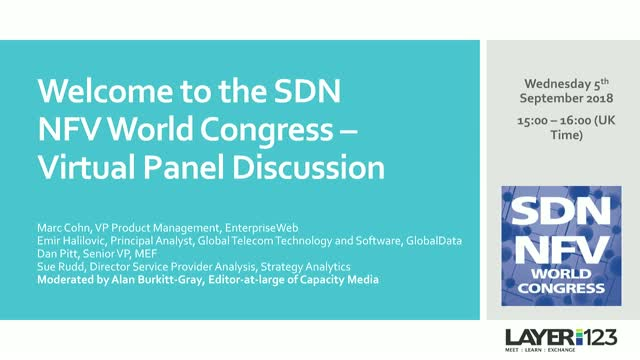 At the SDN World Congress last year, 6 challenges that are preventing network operators from using OpenStack for Distributed NFV deployments – specifically for virtual CPE or vBranch use cases – were presented by BT. This webinar will further explore these challenges and will begin to identify solutions, which in the short-term range from leveraging existing Linux capabilities, selective use of OpenStack, and other open source projects like OpenDaylight. This webinar will also identify promising OpenStack blueprints and projects for longer-term solutions. Thanks to its ease of deployment and relatively low cost compared to fiber, microwave remains a widely used technology for transport, especially for mobile backhaul application. The introduction of 5G, Internet of Things and Cloud will lead to a tremendous increase in the volume of data traffic. In order to cope and deliver the requested capacity, new concepts and approaches are needed. The combination of several frequencies with different physical properties will be one path explored by the industry actors. This webinar explains the concepts of Carrier aggregation in microwave and millimeter waves, illustrates the benefits and describes the challenges for next steps. Imagine if your network could easily instantiate new functions to create new services for your customers and adapt on demand. Imagine a high performance and high available infrastructure optimized to deliver Virtualized Network Functions at scale. Imagine it designed and tested, ready for your business. This session will present how the network transformation, defined in Cisco’s Open Network Architecture strategy, creates real opportunities for you, leveraging innovative orchestration and automation technologies, an extensive portfolio of Virtualized Network Functions and a packaged NFV Infrastructure. The results of the independent tests performed by EANTC will be presented to validate the value of the architecture. Join us for the webinar to start transforming your business. For service providers migrating to SDN and NFV, operationalizing new, virtualized services in a hybrid environment requires modernizing the existing BSS/OSS environment and unifying cloud, resource and service orchestration. Without both, monetizing new applications and services is exceedingly difficult if not impossible. In this webinar, NEC/NetCracker will discuss the migration path to generating revenue from new, virtualized services and applications, highlighting practical recommendations for modernizing the BSS/OSS alongside essential orchestration solutions. To maximize the opportunity presented by SDN and NFV we need to start planning operational tasks from a new perspective. In this session Alcatel-lucent will highlight how Lean principles are being applied to the operationalization of NFV to enable efficient and automated dynamic services. The session will outline a framework for network and service orchestration followed by a demonstration of Lean NFV operations launching VPN and VoLTE services using an OpenStack based platform. The rapid evolution of standardized commodity computing infrastructure, over the last few years, has created an opportunity to build communications networks in totally new ways. NFV represents a new approach to building networks that will ultimately provide numerous benefits to network operators, including reductions in both capital and operating expenses and the promotion of rapid innovation in the services space. This webinar focuses specifically on the evolution of fixed and mobile multimedia consumer communications services, detailing not only the technology behind virtualizing these services but how network operators are employing NFV to remain competitive in this important market. Metaswitch is at the forefront of NFV deployments in the telecommunications industry with an innovative IMS core, designed from the ground up to run in the cloud, and a unique, carrier class SBC that can run on COTS hardware or in public or private clouds , along with a carrier class TAS solution re-architected for cloud environments. From multimedia applications to infrastructure, our virtualized network functions have already been deployed in some of the world’s largest network operators to provide VoIP access and interconnect security and interworking along with IMS Core functions and app servers for OTT, VoWiFi and VoLTE service migration. As leaders in the Network Software Provider revolution, our fully-virtualized product portfolio also powers the business unified communications offerings of converged carriers around the globe – and we can do the same for you. Join our webinar and learn how you can start virtualizing key fixed and mobile multimedia communications services today, increasing scalability and flexibility while dramatically reducing your capital and operational costs: Realizing the promise of NFV. CHANNEL123 - part of Layer123's industry knowledge exchange platform - is a focus for thought leadership, an incubator for innovative ideas and an active support system for the business and technology ecosystems that drive advancement in key technologies, architectures, services and standards in optical, switching and IP/services layers.